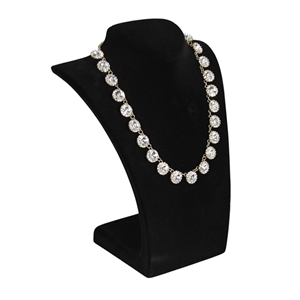 Highlight the beauty of any necklace with our classic Curved Bust Necklace Stand. This display bust is perfect for vendor events, trade shows, store fronts, craft shows, and personal use. It features a black flocked finish to protect your jewelry from scratches and damage. It enhances the beauty and elegance of your jewelry pieces. Perfect for taking photos, displaying, or showcasing your collection.